Inspired by the Monastery of the Caves in Kiev, these caves at Kholki struggled through most of its history before being restored and resurrected by a former Communist Party official in 1990. One of the interesting geological characteristics of southwest Russia is the extensive chalk formations that underlie a large part of the Belgorod Region. This terrain of small rolling hills proved an ideal site to build a cave monastery, in the settlement of Kholki, (74.5 miles northeast of the regional capital of Belgorod). 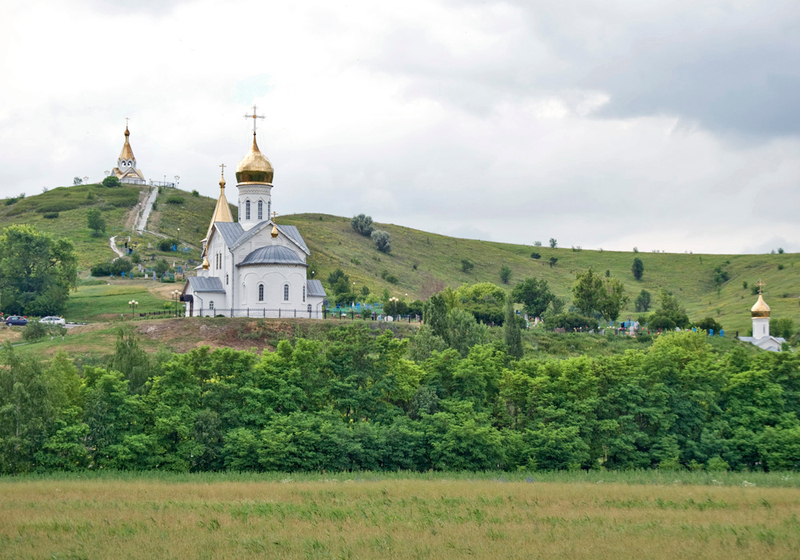 The picturesquely situated monastery is located near the confluence of the small Kholok River and the Oskol, a tributary of the Seversky Donets, which flows through eastern Ukraine. Cave monasteries were known and revered in medieval Russia since the Monastery of the Caves was founded in Kiev by the monks Antony and Feodosy in 1051. Another notable example is the Pskov Dormition Cave Monastery, with origins in the late 15th century. While there is little information about origins of the Kholki monastery, technical evidence from the caves suggests they were the the work of monks from the Kiev cave monastery, during the 15th century. Located around 425 miles to the east of Kiev, the Kholki area was better known in early medieval times as a boundary region between the domains of Kiev and various competing tribes of the steppes. According to legend, Kholki was the site of a meeting between Prince Igor Svyatoslavich (1151-1201) and his brother Vsevolod in 1185, before they embarked on a campaign against the Polovtsy. This unsuccessful campaign would be enshrined in Russian literature and music, most notably in Alexander Borodin’s opera “Prince Igor. How to get there: Take a train from Moscow to Belgorod (Kursky Railway staton, travel time 8-9 hours). Then take a local bus to Valuyki (departure 9:20 a.m. or 7.20 p.m.), then take a local train to Stary Oskol and get off in Kholki. The earliest written reference to what was then known as the Kholkov-Tsarev-St. Nicholas Monastery dates to 1620. At that time, the abbot was the monk Gelasius. During the latter half of the 17th century the monks excavated a space for a small church dedicated to the Holy Trinity. Funds for the monastery’s support were scarce, and in 1653 Tsar Alexei Mikhailovich granted the right to construct a watermill nearby on the Kholok River. At this time the Kholki region was under threat of attacks by Crimean Tatars, and in 1666 a lookout post was established above the monastery on Zhestovaya Hill. In 1757 a wooden chapel (later church) was built at the entrance to the cave complex, but in 1764 the impoverished monastery was closed as part of Catherine the Great’s secularization of monastery holdings and reorganization of the monastic system. Over time the abandoned caves filled with rubble, although sporadic attempts were made to reopen them. One such unsuccessful attempt was undertaken in the 1830s by the eccentric Prince Andrei Borisovich Golitsyn (1791-1861), expelled from St. Petersburg in 1831 by order of Tsar Nicholas I. Golitsyn had sent a sweeping denunciation accusing those close to Nicholas of being Masonic conspirators. The irate emperor subjected Golitsyn himself to arrest followed by a long period of exile, part of which was spent at his estate in nearby Novy Oskol. After Golitsyn’s quixotic attempt, the cave complex fell into total neglect. The monastery was not forgotten, however, and in 1909 a local priest, Father Vyacheslav Vasilchikov, exhorted his parishioners to restore the monastic site, including the subterranean Trinity Church. By 1915 the restoration of the site, with a chapel at the entrance, was largely complete, but the imposition of Soviet power led to the closure of the entire complex. Fate took an unexpected turn in 1990, when Vasily Ponomaryov, a Communist Party functionary at the regional center of Chernyanka, left his position and devoted his life to rescuing the remnants of the Kholki caves. With the help of other enthusiasts the cave complex was restored and opened that same year as a museum. In 1995, worship services resumed at the site and in 1997 construction began on a monastic ensemble designed by the architect Andrei Rodygin. Rodygin’s masterful work drew its inspiration from the medieval churches of Novgorod and Pskov. The centerpiece of the ensemble is the Church of the Don Icon of the Virgin, whose interior contains impressive wall paintings by Alexander Rabotnov. At the entrance to the cave complex is the small Church of Sts. Antony and Feodosy Pechersky (of the Kiev Cave Monastery). Within the caves themselves, the Church of the Trinity was refurbished with a new icon screen and images carved in the chalk walls. The hill behind the monastery serves as a pedestal for the Chapel of St. Vladimir, with its soaring “tent” tower. In front of the Church of the Don Icon on the path to the hillside cemetery is a small chapel over the grave of the architect Rodygin, who died in 1998 at the age of 43 and did not live to see the opening of the Trinity-Kholki Monastery the next year. The few monks at Kholki live in a modest brick building just to the southwest of the main church. On a promontory to the north of the monastery is an equestrian monument to Kievan Grand Prince Sviatoslav Igorevich (sculptor Vyacheslav Klykov). Sviatoslav (942-972) was renowned for his many battles with steppe peoples including the Khazars, whom he decisively defeated in 965. Sviatoslav was also known for his adherence to paganism and refusal to accept Christianity, unlike his mother, Princess Olga, and his son Vladimir, to whom the chapel above the monastery is dedicated. Sviatoslav was ambushed in March 972 by Pechenegs, whose leader, Khan Kurya, purportedly made a drinking cup from his skull. Vladimir, who ruled as grand prince in Kiev from 978 to 1015, renounced pagan gods and in 988 accepted Orthodox Christianity as the religion of the vast territory of Kievan Rus.